This holdfast was made for the 2019 Spring Swap which was a surprise swap that I didn’t join in but followed closely. When time for the reveals was getting close, EarlS, running herd over the swap, contacted me and asked me to make something for PoohBaah (Neil). Earl was afraid Neil wasn’t going to receive anything from his sender. I had previously offered my services to Earl for just such an occasion. Now I had just a day and a half to get this shipped. The next morning, I went on a search for 11/16” round bar which would be just right to fit in a 3/4” dog hole, no luck. 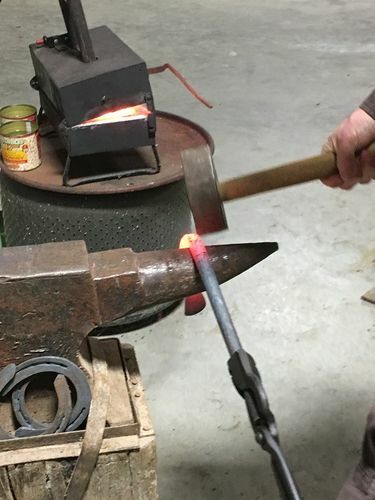 All I could find was 3/4” unknown steel so I had to reduce the diameter of the shaft to make it fit, which I was doing in pictures 2 and 3. Then I started shaping the foot (flat part) and next the bend for the springy part. I actually made two, but one wasn’t going to work. 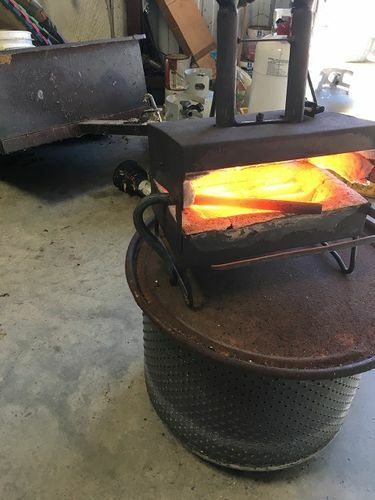 The next morning, I decided the one I was going to ship needed some more work, so I re-heated it and refined the curve and straightened the foot. I wish I could have spent more time on it Neil, but had to ship it out to you that afternoon. My thanks to Earl for running a great swap and I’m very happy to have been able to contribute a little bit. I like that little forge Duck. It’s bigger than mine. The double burner is nice but mainly I like the wide front opening and the option to slide something in the side like you did. Excellent job on the holdfast too! 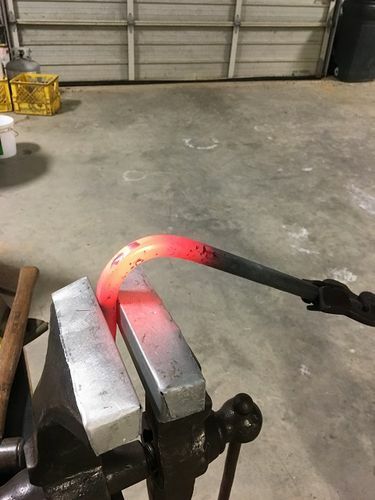 I’ll have to find some steel and make a couple for myself. 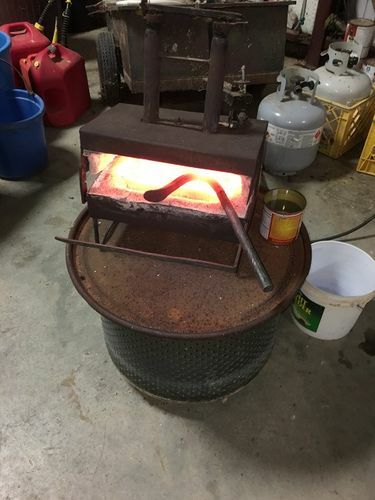 I have the Gramercy ones from long ago before I had a forge but using homemade ones would be pretty awesome. Solid gesture of your time and talent, Duck. That is some nice work. I’m sure he is happy with that. Duck, you are the Man. Wood work, metal work, you seem to do it all. Really nice job on the holds. Also thanks for stepping up! Excellent work under pressure, Duck! Kudos! Thanks guys! 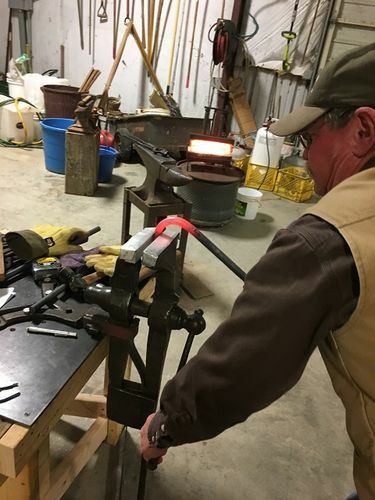 Dave, most of my useful information came from Dave Switzer’s you tube videos (Black Bear Forge) which are a wealth of information and where I learned that 11/16” round bar works the best. Here .I think he buys his from McMaster. I’m still pretty new to this game and my shoulder hurts, but I’ll keep on. I actually like a combination of forged work married to wood work and will explore that some more. Very nice work, first rate hold fast. 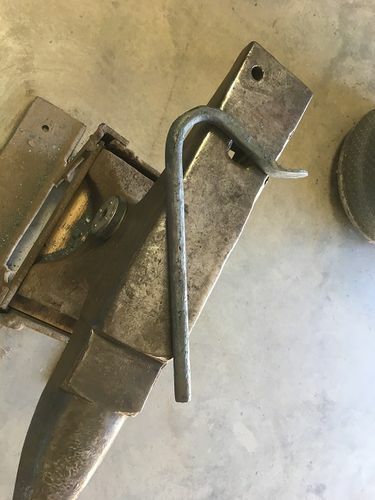 Thanks Brian, kinda rough but it holds in an oversized hole. Duck, solid work buddy. I have two of Dave’s Phil Koontz style hold fasts and the 11/16’s shaft works exceedingly well on my bench. I’m glad you posted this for everyone to see. You went WAY beyond the call of duty on this one. Those are some great action pictures. My shoulder, arm, back, legs, and everything else are sore just looking at all that work. Thank you for helping out with the swap. I’m sureNeil is thrilled with the holdfast. Hopefully, you can participate in the BBQ Swap. Hat’s off to you and a big THANK YOU!!!!! It is a woodworking tool Duck. Looks like fun and great last minute entry to the swap. You may have to change your LJ handle to ducksmith. This is sweet awesomeness Duck! Let me know when you start selling these puppies. I’ll take two! Duck, awesome job, man! 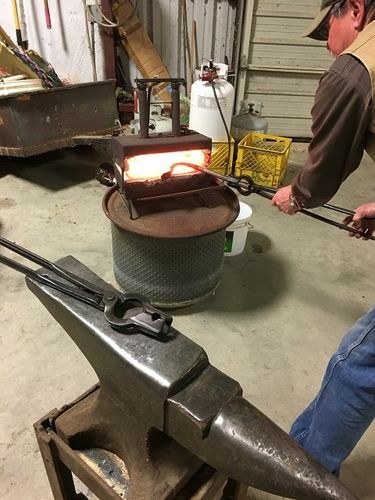 Glad that blacksmithing set up is earning it’s keep. Yes I am grateful that you took the time to make me an awesome tool. Solid work as always Duck!